Home » Theory » Why Did The Serve And Volley Die Out? What did the following matches have in common? They were all fabulous style contrasts between great serve and volley players and great baseliners. Since the early 2000s, all we see now in tennis are baseliners playing other baseliners. So what happened to the formidable serve and volley style that earned Sampras 14 majors, Navratilova 18 and McEnroe seven? And will it ever come back? 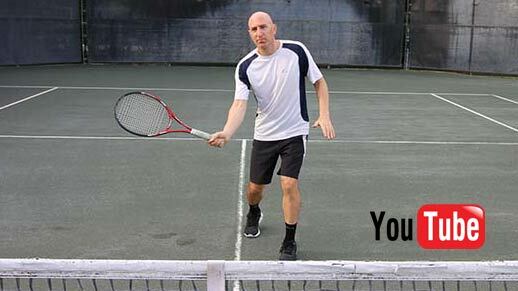 Sadly, over the last two decades, the serve and volley game has died out due to slower court speeds, softer balls, better rackets, enhanced string technology, and improved fitness and strength in today’s players. 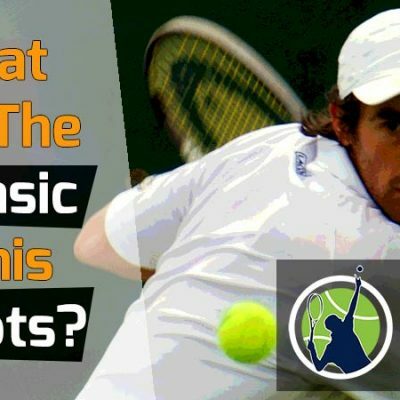 To boot, the serve and volley is difficult to master, takes a long time to learn and is deemed unnecessary by many of the top coaches in the world today. 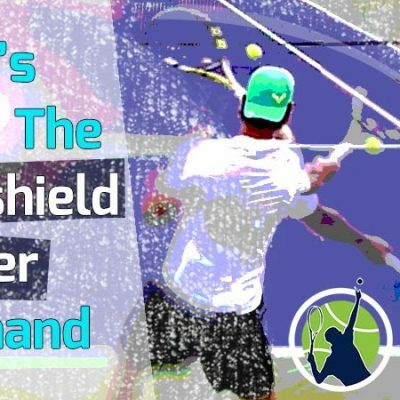 While the serve and volley game has died out on the pro level, at the lower levels of the sport, such as the club level, it can still be remarkably effective. We’ve written articles specifically on how you can use serve and volley to win at the club level, and even on clay. However, this post will exclusively focus on the history of serve and volley game at the professional level of tennis. So let’s now take a look at the various factors that contributed to its marked decline over the last generation. Without a doubt, the speeds on hard court and grass have become slower. These surfaces account for 3 of the 4 majors played in a calendar year – with only the French Open played on clay. 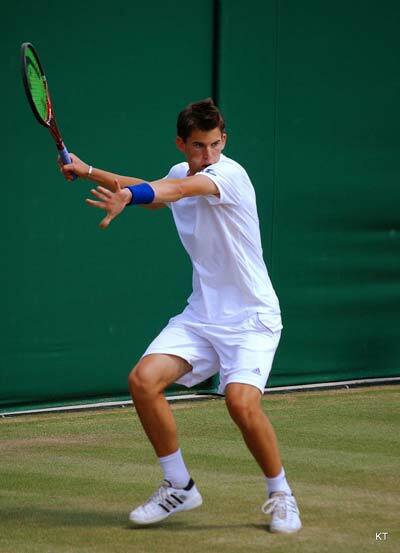 Faster courts (like grass) where the balls skid low favor serve and volley players, as it’s much more challenging for a baseliner to hit back a good shot when it’s low and fast. This why serve and volley players have historically had such great results at Wimbledon and such poor results at the French Open, where the soft red clay courts slow down the ball and increase the height of the bounce. According to player testimony, it appears all the various court surfaces in tennis, with the exception of clay, are becoming slower. Players have been talking about this for years. Slower courts always favor baseline players. Wimbledon even changed the type of grass they use to a perennial ryegrass, which is known for being slower than the traditional grass previously used. 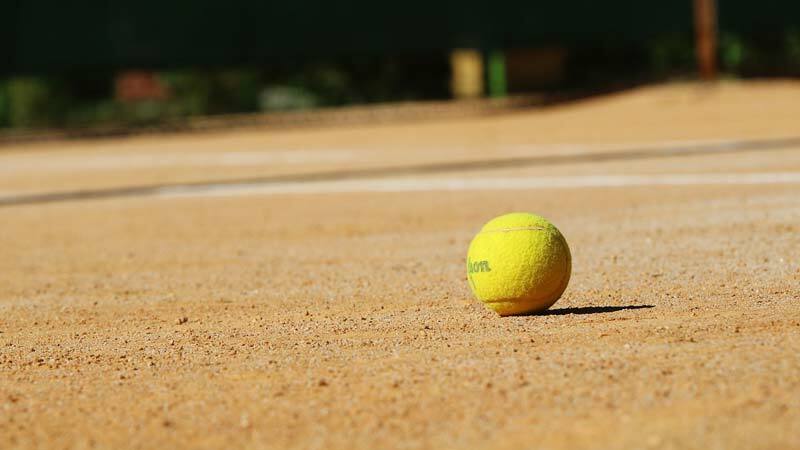 Dustin Brown, a professional tennis player who has played at Wimbledon many times claimed, “Every surface has its own characteristics, and Wimbledon and grass courts should be faster”. Hard courts are slower now too. More sand added to the paint on the court slows down the speed of the ball, which is what tennis directors have been wanting for years. But why? It’s because the fast-paced serve and volley style is not considered exciting for the audience. It’s largely a one-and-done style where the point is won or lost quickly. Baseline rallies, however, are longer, more fun to watch and add drama to the match. This equates to more viewers, increased fan excitement and participation and better revenue. During the 1994 Wimbledon finals, Sampras and Goran Ivanisevic served and volleyed almost every point of the match in three quick sets with Sampras taking the crown. There were few rallies, the points were short, and the tennis was very predictable. Fan response was not good, so the people at Wimbledon and the ITF decided to make changes. The courts at Wimbledon were to be made slower to encourage more rallies. A new type of grass was used to slow the courts down at Wimbledon. Vast, sweeping changes in tennis began to take place. 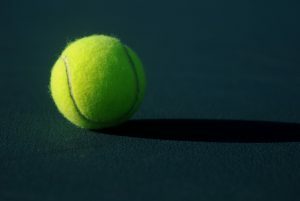 To encourage longer rallies, the ITF (International Tennis Federation), who oversees tennis, decided in the early 2000s to make the courts slower and the balls softer. This allows more time for the baseliner to get to the ball and set up for a big shot. These changes, even if small, in court speed and ball softness can have a huge impact on a serve and volleyer’s success. Along with the other factors mentioned in this article, I’m afraid it put the final nail in the coffin for the serve and volley style – at least for now. Hard courts slowed down as well in the 90s. Players took notice of these changes and slowly adapted their games to be a baseline style. When Roger Federer came on the scene in the late 90s, he was more of a serve and volley/all-court player. As the 2000s moved on, Federer was forced to become much more of a baseline player. Even a serve and volley player of his level couldn’t compete with the new generation of powerful ball-strikers. 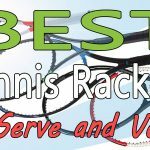 The innovative rackets, improved strings and slower conditions all worked in favor of the baseline game. In September 2001, the Independent Newspaper published an article about how the ITF deliberately requested the companies that provide balls to the WTA and ATP to make them slower on fast courts. Interestingly, the ITF also wanted the speed of the balls to be faster on red clay. Personally, I believe the different types of courts are what make tennis so great. I love the contrast in court surfaces and it’s always interesting to see how players adjust to them come time for the different tournaments. It seems the ITF wants all court speeds to be the same speed, though they never will be. It’s like trying to make all baseball parks uniform. It would kill the charm of the game. From a fan stand-point and for the sake of revenue, I understand slowing the game down on fast surfaces. Both the purists (who wish for things to remain the same) and the new guard (like the people at the ITF) can each make a good case for their argument. However, it’s a moot point to argue now, as the changes have been made and implemented now for well over a decade. To get back to ball speed, three different balls were introduced to the pro game. On hard court surfaces, something called a “type 3” ball was used, which is 6% larger in diameter and moves slower in flight. 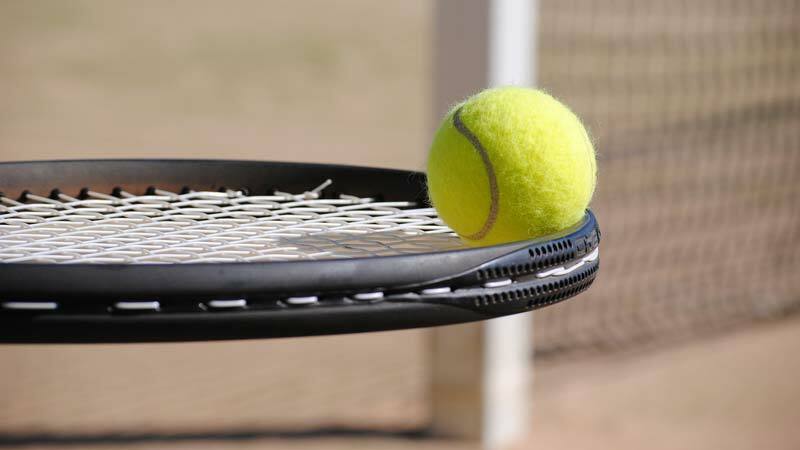 The ball will come off the racket with the same speed as a standard ball (the type 2 ball) but provide 10% more reaction time to the opposing player. This is because a type 3 ball slows quicker in the air than a traditional type 2 ball does. While it seems that players are serving faster than ever, which they are, the balls are slowing down quicker once in mid-air. That’s why players can return back serves of 130 mph. 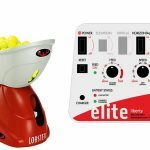 The radar guns on tour are clocking the ball directly when it comes off the racket but by the time it reaches the opposing baseline, the speed has declined significantly. These lower ball speeds are producing more rallies and discouraging any type of attacking game. As the great serve and volley players of the 1980s and 90s retired at the dawn of the new millennia, upcoming players began abandoning the tactic in favor of staying on the baseline. 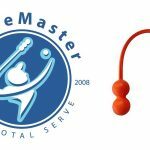 All of the factors discussed in this post (balls, courts, racquet and string technology, player ability) came together in the just the right way to slow tennis down. Coaches saw the light early on and encouraged players to win from the baseline. 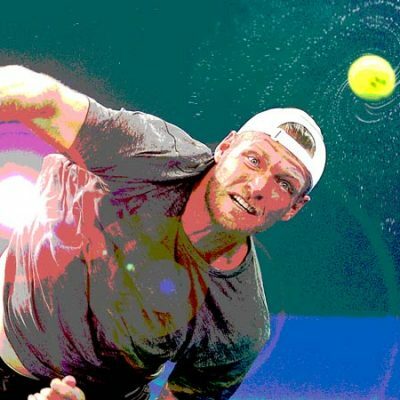 Instead of another Pete Sampras emerging in the new century, we got Lleyton Hewitt and David Nalbandian, two less than inspiring baseline players who were allergic to the net. A few years later Rafael Nadal and Novak Djokovic burst onto the scene and dominated tennis, along with the greatest player of all time, Roger Federer. All are pretty much strict baseline players who rarely venture to the net, though Nadal and Federer have good volley games and go on occasion. Still, in comparison with the great serve and volley players of the previous generations they hardly come to net. For much of tennis history, wooden rackets were the norm. 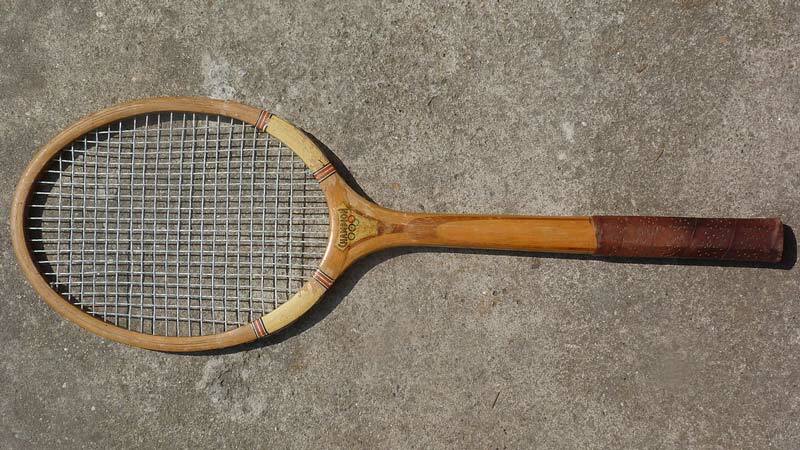 These wooden rackets were heavier than today’s rackets, had a smaller head size, were not very flexible and limited a player’s ability to hit power and spin. These wooden rackets dominated the open era of tennis during the 1960s and 70s, with top professionals like Ken Rosewall using them to advance to the finals of majors. When I grew up in the 1970s, it was common to use wood rackets. They were heavy with long necks and small heads that made the game difficult to learn. But that’s all we really knew. Then in the mid-to-late 70s, Jimmy Connors become one of the first pro tennis players to start using a new racket technology. These new rackets were made of steel and were an improvement over the wood. The first steel racket was called the T-2000 (developed in 1967) and was made popular by Connors. Rackets made of aluminum began to make an appearance too. Some players began experimenting with the new technology and transitioning away from wood. Still, the rackets were not powerful or good enough to affect the serve and volley game, thus it remained perfectly intact. Then, in the 1980s, graphite rackets were developed. These rackets had bigger frames, were lighter, more flexible and powerful. Players could take big swings and still keep the ball in play, generating more spin than ever possible with wood and aluminum rackets. John McEnroe and Steffi Graf were among the first tour pros to begin using graphite. As time moved on, the 90s saw even better racket technology with composite materials. Rackets became even more light and powerful. Still, the serve and volley game dominated Wimbledon and grass court tournaments alike. It was also thriving at the U.S. Open, where Pete Sampras and Patrick Rafter combined to win 6 singles titles at Flushing Meadows in that decade. As the new millennia came and went, even better rackets were being produced. At this point, rackets were so good, that baseline players had lost much of the fear of their opponent’s coming to net. The few who tried to serve and volley in the early 2000s, like Taylor Dent and Radek Stepanek, were consistently passed. They and their kin were torn asunder under the heavy barrage of groundstrokes afforded by the new racket technology. Nowadays you can choose from an incredible range of fine-tuned equipment to match and accentuate aspects of your game. If you enjoy S&V you should consider using a racket that will make the most of this style. I saw Dent play at the U.S. Open in person. He was a young American hopeful at the time, who boasted a 140 mph+ serve and excellent volley game. He was taught by his father, Phil Dent, a former ATP level player from the 1970s. Taylor Dent’s style was all serve and volley but he unfortunately started his career in 2002, when it was all but on life support. Phil thought his son could use the serve and volley style to be successful at the professional level, as he had witnessed in the 1970s and 80s. 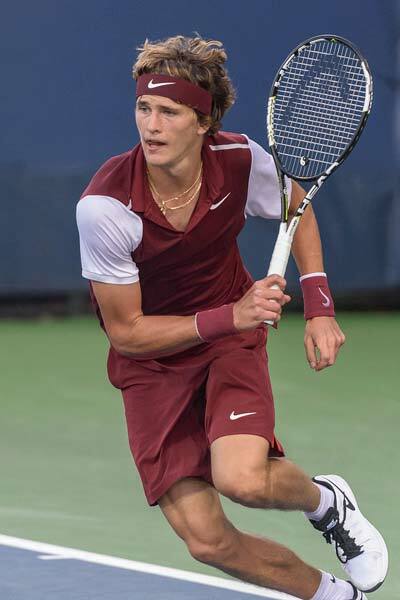 However, and unfortunately, Taylor Dent’s career was largely a failure and his best result at a major was only making it to the fourth round – once at the U.S. Open (2003) and once at Wimbledon (2005). As a result of back and groin injuries, Taylor Dent was forced to retire in 2010 at the age of just 29. As of this date, no other American male or female player has attempted the serve and volley game in pro tennis. For most of modern tennis history (circa 1880 forward), natural gut was the preferred tennis string. The intestines of animals, like sheep, were thought of as the perfect material for string, as they were elastic, flexible and retained tension. However, there were drawbacks to using natural gut. It was costly, not very durable, and it retained moisture, which negatively affected its playability. In the 1970s, a new kind of string was developed out of nylon, called synthetic gut. This type of string was more economical in price, lasted longer and offered good playability. Synthetic gut made its appearance in the 80s and this allowed for better playability. Other types of fibers were created that offered players even more feel and spin. Ultimately, the tennis world was introduced to polyester strings that would forever change the game. The new polyester strings started to make their appearance in the mid-to-late 1990s. With players having so much success with them, nearly every player on tour was soon using them – either as a hybrid with gut or going exclusively poly. Poly was really the first string to alter the landscape of tennis and disrupt the serve and volley game. 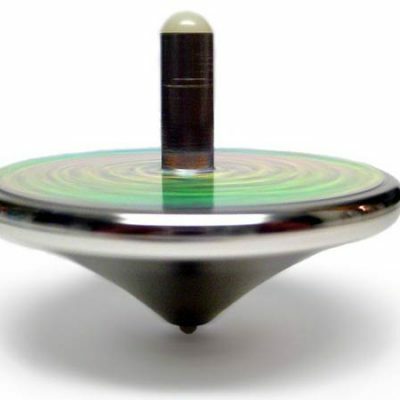 Poly is known for allowing a player to generate huge amounts of spin. Passing shots can be as high as 10 feet with them and still land inside the court. With so much spin on the ball, coming to the net is now a hazardous ploy. Today’s players, like Rafael Nadal and Jock Sock, hit with insane levels of RPM (3000+) on their forehand groundstrokes. This causes their shots to dip with so much arch the net player can’t react in time to volley effectively. Today’s string technology is more advanced than ever, with players using combinations of different materials in the cross (horizontal) and mains (vertical) of the racket to produce amazing power and spin on the ball. While Nadal plays mostly with a co-poly (blend of polyester and nylon) string, Federer and Djokovic prefer natural gut in the mains and polyester in the cross strings. Club players can string the same way as the pros if they wish. The strings of today give baseline players a level of power and control that could never be achieved with the natural gut of the past. This fact, combined with vastly improved racket technology, has resulted in faster shots with more spin and precision. 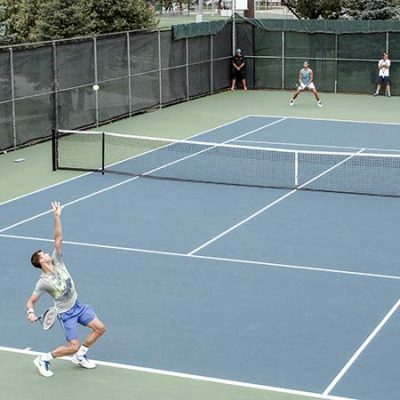 These powerfully accurate shots bode very badly for the serve and volley player. 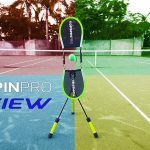 On the flip side, a case can be made that the serve and volley player also enjoys an advantage by using improved racket and string technology. Serves can be hit harder and volleys made more precise. While this is true, the other factors that have slowed the game have decidedly tipped the scales in favor of the baseline player. Consequently, it’s unclear if the serve and volley game will ever be able to overcome the steady advances in tennis technology. 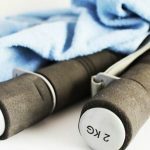 Tennis players, as well as athletes in all sports, have benefited from increased technology in training routines and nutrition over the last 40 years. This is evident in every major sport, including tennis. The increased technology, which includes tools such as apps that track every calorie a player eats, or every step a player takes, offer both player and coach a detailed blueprint of his or her progress over time. Tennis players can now benefit from precise data in real-time and analyze it to make improvements. The players of the 1970s were in decent shape, but they knew little about conditioning and diet compared to the explosion in knowledge that we see today in those fields. Players of today are super-human in terms of speed, flexibility and endurance. They know the right way to train and how much to train. Additionally, the recovery phase of a player’s routine has greatly improved as well. The results are players that more resemble superheroes than anything else. Perhaps nobody is more of a shining example of this than the brilliant Novak Djokovic. His amazing speed, dexterity and court coverage are unparalleled in the history of tennis and a direct result of eating the perfect diet and knowing the ideal way to condition his body for the arduous baseline style. His recovery methods are also far superior to what any player could achieve in the 1970s and 80s. Today’s players have access to cryotherapy, bariatric chambers, compression garments, etc., that enable them to recover quicker and easier. Due to these increases, players are faster and stronger than ever before. Not only that, the average professional tennis player is taller and more athletic than previous generations. It’s not uncommon to see 6-foot tall women crushing shots from the baseline, while many upcoming male tennis players are now over 6”2”. Guys that are under 6-feet tall are a rarity in the top 50 of the men’s tennis game. Gone are the days when a 5’8” player like Michael Chang could win a major or become top 5 in the world. While tall players existed in the 1970s and 80s, they were generally slow of foot and didn’t make an impact on the game. However, today’s players are tall (many being 6’3”- 6’10”), athletic, graceful and get around the court well despite their height. The crazy thing is that the new breed of players is perfectly suited for the serve and volley style. Yet they are all playing the baseline game! McEnroe has said on more than one occasion that if he had the height and serve of John Isner (an American pro tennis player who is 6’10” and has one the best serves in tennis history), he would never stay back, even in today’s era. I agree with Johnny Mac on that one. Summary – Will The Serve And Volley Game Ever Return To Professional Tennis? With the big three (Nadal, Djokovic and Federer) dominating the majors and tennis over the last 15 years with their baseline style, it’s clear to coaches and young players that serve and volley has no place in the singles game any longer. Players today are taught to stay back and bang it out from the baseline. 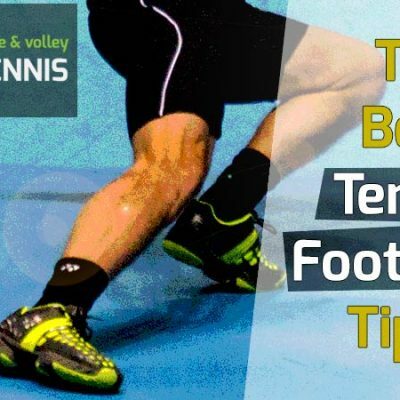 Any attempt at serve and volley is discouraged and even if a young player wants to serve and volley, the chances of success are slim due to all of the factors mentioned here. Additionally, the serve and volley game requires years of practice to build into an effective art form and only a very small percentage of players are capable of it. However, I’m a firm believer in cycles. They are evident in history, trends and life in general. What is fashionable now does not stay in fashion. I believe a time will come when the serve and volley game will rise from the ashes like the Phoenix and makes its return to professional tennis. It may take five years, 10 years or even 15. But I do believe the next great serve and volley player is alive today and will revolutionize tennis in the not-so-distant future. To paint a visual for you, it might be someone with the serve of John Isner, the volley touch of Stefan Edberg and the athleticism of Djokovic. Imagine how dominant such a player could be serving and volleying? Nobody would see it coming. A 6’6” dynamo, barely out of his teenage years, who bursts onto the world stage and revitalizes the serve and volley game on all surfaces. Or maybe it will be a female player with power and athleticism of Serena Williams and the adroit touch of Martina Navratilova. In time he or she becomes practically unbeatable on grass and hard court and the tennis world immediately takes notice. Not long after, coaches begin training their young players to serve and volley, as that again proves to be the most dominant style in tennis. While I’m a baseline player at heart, I long for the serve and volley game to make its return. It’s truly a lost art that adds a great contrast to professional tennis. Until then, the serve and volley will remain dormant – a sleeping giant awaiting the right player to wake it back to life. That day will come. And I will rejoice. Why Is Roger Federer Most People’s Favorite Player? 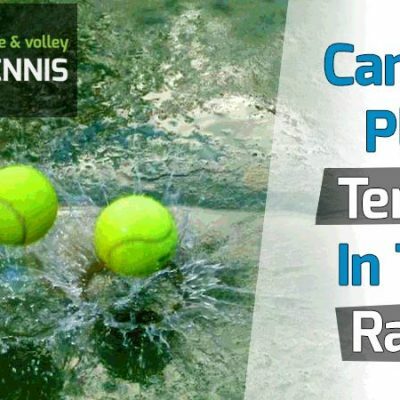 Can You Play Tennis In The Rain?